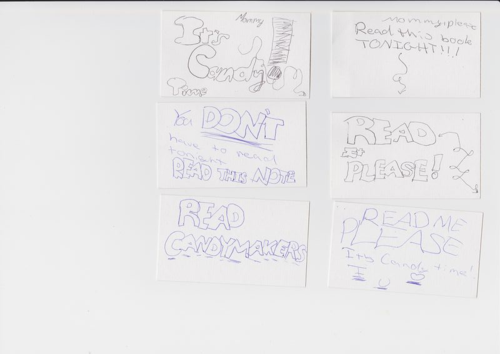 For months now, my 8 year-old daughter has hounded me to read her favorite book – The Candymakers by Wendy Mass. She is a huge fan of Mass, an author of tween and teen books, and has read probably eight of Mass’ books so far. The Candymakers, which she read over the summer, was her favorite, and she has been talking about it ever since. 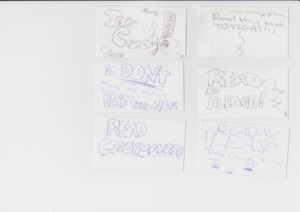 Well, guilt got the better of me after a week of these notes, and I started The Candymakers. Turns out, it’s a pretty good book! It’s about a candy factory, run by the Candymaker and his wife, and a annual contest for kids under the age of 13 to create the best new candy. Contestants come from different regions and use their local candy factory to concoct their creations. Four kids are competing at the Candymaker’s factory – a snobby boy, a boy who carries a weird backpack and has all sorts of strange superstitions, a girl who seems too nice, talented and perfect to be true, and the Candymaker’s son, who has his own baggage to contend with. The book is told through the different perspectives of each kid, and over the course of the book, we get to the bottom of the challenges that each kid faces and how they overcome them. There’s a mystery to solve, a lot of secrets to uncover, and a wonderfully imaginative setting that brings to mind a less sinister Willy Wonka factory. There are plenty of adult themes here too – loyalty, accepting physical deformities, parental acceptance, and teamwork. It’s also a freshly current tale, which kids today won’t dismiss as old-fashioned or corny. So I recommend The Candymakers, for kids especially but for adults too who want to check in with what the tweeners are reading these days. I posted recently on Facebook about my daughter’s challenge to me, and several friends commented that their daughters were big Wendy Mass fans too. Definitely a writer to keep an eye on. And now, a short interview with my daughter about why she liked the book so much. Q: You read a lot of books. Why is The Candymakers your favorite book? A: It’s interesting. I like the different perspectives. It’s fun to read. A: Daisy. I like her background. Q: Would you ever want to be a spy? A: Probably not. It might be really hard to do missions. Q: What do you like about Wendy Mass as an author? A: She’s really creative and her books are really fun to read. Q: Any other Wendy Mass books you’d especially recommend? Q: If The Candymakers were made into a movie, would you see it? A: Yes! I’d like to see Emma Watson as Daisy.